1. 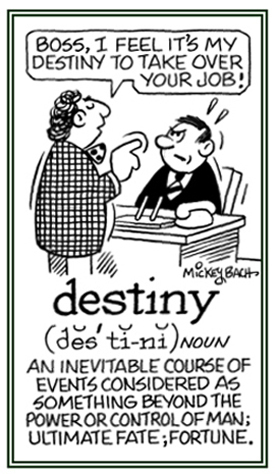 Something that unavoidably befalls a person; fortune; lot. 2. The universal principle or ultimate agency by which the order of things is presumably prescribed; the decreed cause of events; time. 3. That which is inevitably predetermined; destiny: "Death is our ultimate fate." 4. A prophetic declaration of what must be. A fortune teller is someone who puts his/her intuition on a paying basis. Fates and their decisions; an old Greek story.